Yonhap Hundreds of members of the Manmin Chungang Songkyol Church (All People's Holiness Church) stage a sit-in in the lobby of the MBC-TV headquarters, in Yoido, Seoul, Tuesday night. The church members demanded that the station stop airing an investigative news program about the church. When members of a religious sect raided MBC-TV studios in Seoul and cut off its programming Tuesday, they drew new attention to the growing rift between news broadcasting stations and controversial religious groups across the country. Disputes over critical television news programs about supicious religious congregations have become common over the years. To cite a couple of latest cases, MBC's airing of an alleged corruption scandal involving a church leader in April last year prompted hundreds of church members to block the entrance of MBC's headquarters in Yoido for more than a day. And last March, a popular SBS documentary program uncovered a scandal involving another church leader, which was also followed by harsh protests from church followers. But no other event has done as much to put questionable religious groups under greater scrutiny than the latest storming of MBC by members of the Seoul- based Manmin Chungang Songkyol Church (All People's Holiness Church). "As shown in the incident the number of church leaders who mystify themselves to expand their congregation have reached dangerous levels," said a church expert. The doctrines of the church-leader Pastor Lee-Jaerock have been condemned as blasphemy by the mainstream. His church, which claims a membership of 60,000, was expelled from the Korean National Council of Churches April 30 after Lee-Jaerock claimed he was Jesus Christ. According to deserters of the church, Lee-Jaerock preached that only followers of his church would survive a coming Armageddon and that he has enough revelations of God to pack more than 100 pages of a notebook. Lee-Jaerock also claims to be endowed with magical healing powers, which he actively uses to recruit sick people to become members of his church, the deserters said. 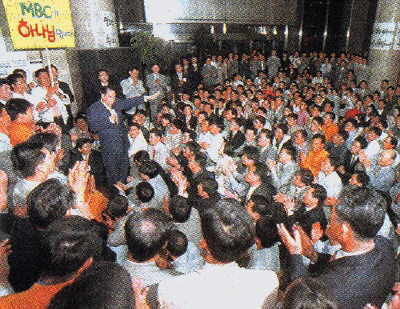 Lee-Jaerock opened a small church in Kuro-dong in Seoul in 1982. Over the past 17 years, the church has fast grown to claim more than 60,000 members. Religious experts note that the AU People's Holiness Church is just one of 3,000 Holiness churches in Korea, a Protestant denomination known only in thiss country. However, the attack on MBC has placed the church in anything but a holy light and may have served to help the media villify it even more. "We will fight any outside pressure to prevents us from revealing the truth," said No Sung-dae, president of MBC in a statement released after the incident. MBC said the questioned program explored pastor Lee-Jaerock's "heretical" statements and gambling habits based on the witnesses of deserters of the church. The church had earlier asked the Seoul District Court to keep MBC from airing the program. After taking the matter up, the court decided to allow MBC to air the program on the condition that MBC delete parts that referred to Lee-Jaerock's sexual life. MBC says it obeyed the order of the court, and is subject to no further restrictions from running the program. Police yesterday sought arrest warrants for six members of a controversial religious sect, who joined hundreds of other members in a raid Tuesday night of Munhwa Broadcasting Corp. (MBC), a television network in Yoido, western Seoul. The raid was the first time in the nation's history that a group of civilians stormed a local broadcasting firm and disrupted the broadcasting of a show. The police said that Chung Yon-ha, 39, the secretary general of a sect called the Manmin Chungang Songkyol Church (All People's Holiness Church) headquartered in Kuro-dong, southwestern Seoul, and five other church officials were charged with interrupting public broadcasting. Under pertinent law, those found guilty of damaging broadcasting equipment at public entities face maximum prison terms of 10 years and fines of up to 30 million won, ($25,000). The Supreme Public Prosecutor's Office called the intrusion a "serious crime," and vowed to ferret out the leaders of the raid and those responsible for destroying TV station property. The incident took place around 11 p.m., when about 300 people arrived at the station in nine buses with Manmin Chungang Songkyol Church markings on them. The group then overpowered MBC guards and broke into the building. They occupied the lobby of the building demanding a stop to the broadcast of a program called "PD Memo," then on the air. The weekly investigative news program was scheduled to deal with the alleged corrupt activities of the church's pastor, Lee-Jaerock, for one hour beginning 11 p.m. Shortly after the program went on air, about 50 protesters forced their way into the main control room on the second floor of the broadcasting station and turned the program off the air. Network engineers re-aired, the program, but not until the intruders interrupted it three more times. The incident was followed by a sit-down protest outside the building by about 1,700 churchgoers who arrived at the scene later and demanded the network to cancel the program. They accused the program of distorting facts and defaming the image of the group and their leader. Police dispatched about 3,000 riot forces in 27 units to break up the protest by 1:25 a.m. yesterday. Investigators are now screening tapes from security monitors to pin-point the leaders of the raid. They are also questioning six church officials under their custody to determine whether church leaders were involved. But church secretary general Chung told police that the raid was organized on the spur of the moment by some over-excited believers during a rally to protest the program. He also denied the allegations made by MBC engineers that intruders randomly touched switches and destroyed equipment to disrupt broadcasting. Meanwhile, MBC's labor union issued an official statement yesterday denouncing the churchgoers for their raid. "We feel unbearable anger at the unprecedented incident, in which freedom of speech was mercilessly crushed by a certain religious group," the statement read. "It was an act that threatened national order. If such criminal acts go unpunished, the nation's freedom of speech guaranteed by, the Constitution may face the prospect of being violated by numerous interest groups in the future." The labor union called on law enforcement authorities to investigate the case thoroughly and to punish those found responsible. The television network re-aired the edited version of the program last night.